A quick and easy kit to take care of trail-side punctures. 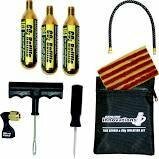 Kit includes everything needed to remedy a flat in a compact and light package. Tire plugs, tire reamer, plug installation tool,12 inch extension hose, Microflate inflator, and three 16g cartridges.